H O M E ... it's an odd word if you look at it too long. Those four letters hold such a strong meaning to so many folks ... us included. HOME may mean a house, a trailer, a boat, or even a van. 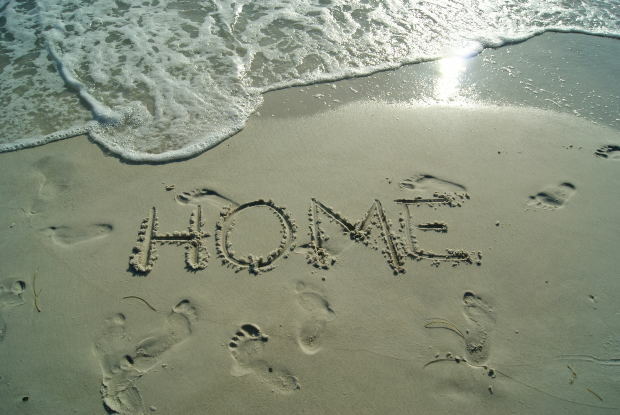 Although the word has various meanings, HOME often brings thoughts of warmth, security and love. If you read my last post, you know that Ken and I have been especially busy the past couple of weeks with getting two special ladies HOME ... my mom and our daughter. I'm happy to say that as of today they are both HOME!! We are filled with joy, relief and hope for their bright futures. While our daughter's journey to her new home was an exciting time, my mom's was not. It's such a relief to know that they are both now where they want to be. My mom was released from the hospital this past weekend, and she seems to be recovering well. We visited Mom on Sunday, and other than her lying on the sofa instead of sitting ... we talked like nothing had happened. She's relaxing at home, eating, and will be receiving physical therapy at home 3 times a week to get her back on her feet. She's able to get around slowly with a walker and she's got some back pain from the spinal tap, but I think she's on the right track. It's going to be a slow process, but I believe that with patience she'll be okay. Just yesterday, Ken received the "Certificate of Occupancy" for our daughter & son-in-law's very first home ... woo hoo! All four of us (Ken, myself, and our two "kids") spent Saturday cleaning and finishing the final touches on the house for Monday's inspection. This morning I'm taking off work to help our daughter move small items in our cars, and tonight the four of us are moving the big items. This is such an exciting time! So happy to hear your good news! I missed your post about your mother while we were on our anniversary trip in the Bahamas, so I did go back and catch up today, and wow, that must have been so scary! So glad that she is doing better and is back HOME. And congratulations on getting the house all finished for your daughter and new son-in-law. Very exciting for all, I am sure. Awesome! Post some pictures of the "kid'" house, I'm sure Ken did a bang up job! So happy things have improved for your family. You guys are an inspiration. I wish I could type out words and have them project meaning as well as you. My wife is a pretty good blogger. She started keeping a journal on Caring Bridge in 2008 when our oldest 22 now but 14 at the time fought for his life against Leukemia in 2008. The fight isn't over, be has cancer scans on his bone marrow this week and is likely facing another hip surgery within 6 months. It's tough but, we can only drive forward and love one another. Life isn't a butter smooth road, it's hills and valleys with potholes in your way. Build your momentum when the free ride comes because trouble is never far away. I wish you all the luck in your journey. I.hope our paths joyfully cross many times in the not so distant future. March 2018 is when I hope to jump ship from the corporate world. So glad your mom is home and on the mend! And isn't a 'new' home just too exciting? I'm sure it's fabulous (and very well built)! Emily, I agree that "home is where the heart is". We can't wait to take our home with us .. whether it's on a boat or like you, a car and bicycles. It is a very exciting time for us to see our daughter settled and happy, and mom improving every day! Patricia ... we'll post some pictures of the new house once we can see past all the boxes .. LOL! Kenneth, I've been keeping up with you and Pam via Facebook, and I know that yesterday was a big (and difficult) day for Trevor. I'm thinking of you, Pam and your family and hoping for great results. You all have definitely had your challenges. You two are also an inspiration! Thanks for your kind words about my writing ... I'm not a professional, that's for sure! We look forward to meeting you two someday ... perhaps on the Mandeville lakefront for a bike ride once all of us get a break! Laura, thanks! I have to admit that Ken builds a great house. We're so excited for the kids!